Cafe Gray Deluxe’s afternoon tea set had already made an impression on me the first time I tried it back in April, for their Diane von Furstenberg collaboration. The unforgettable scone maintained its place in my heart over the months. Then, after my mother had a few disappointing experiences at different hotels, and started complaining that none of the afternoon tea sets in Hong Kong are good anymore, I knew exactly where to take her. Perhaps I’m a bit obsessed with Cafe Gray Deluxe because I’ve actually also been here for dinner. But with a sea view like this, it’s hard not to come back when you feel like treating yourself. Admittedly, the view is probably a notch less spectacular than the 103rd floor of ICC (i.e. Ritz Carlton), but still, the environment was top-of-the-list enough. What probably makes the general dining experience here so enjoyable as well is the flawless service. Actually, it was my mom who brought it up and then we spent a good 20 minutes discussing how important service training must be at this hotel (and should be everywhere else). I’m usually stick with typical earl grey or English breakfast and avoid anything herbal or fruity. On this day I was feeling adventurous and opted for their Cafe Gray tea, as the addition of lemongrass appealed to me as something relaxing for this Saturday afternoon. The pot came and was dyed bright pink, thanks to the roselle and I felt nervous that this would be yet another disappointing weird fruity but tasteless tea. But it was amazing; it was extremely full of flavour, with strong lemongrass aroma. I would honestly highly recommend it, especially if you are a fan of lemongrass. 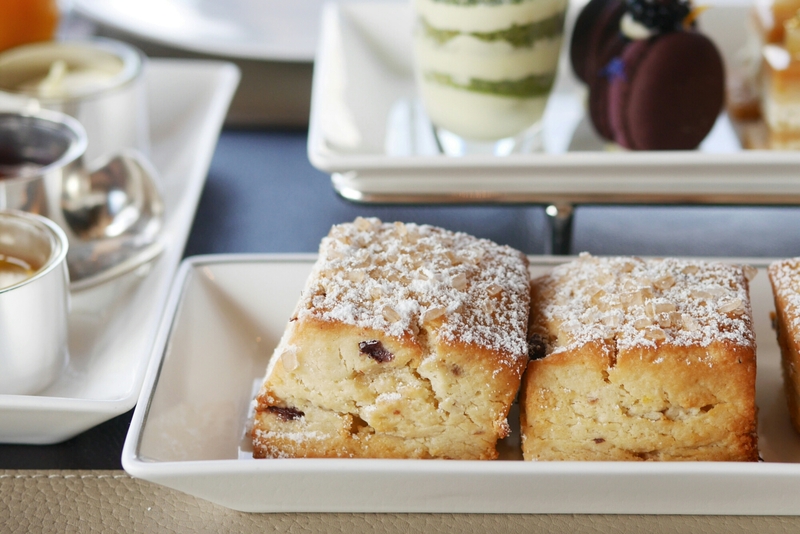 We must agree that scones and clotted cream are the integral part of any afternoon tea. However, this element also seems to be the most disappointing at other places (purely based on my own and my friends’ anecdotes). Here, the scone had a thin crispy exterior and a super moist and slightly crumbly interior. It’s topped with coarse pieces of sugar which adds to the textural complexity of an item seemingly so simple. 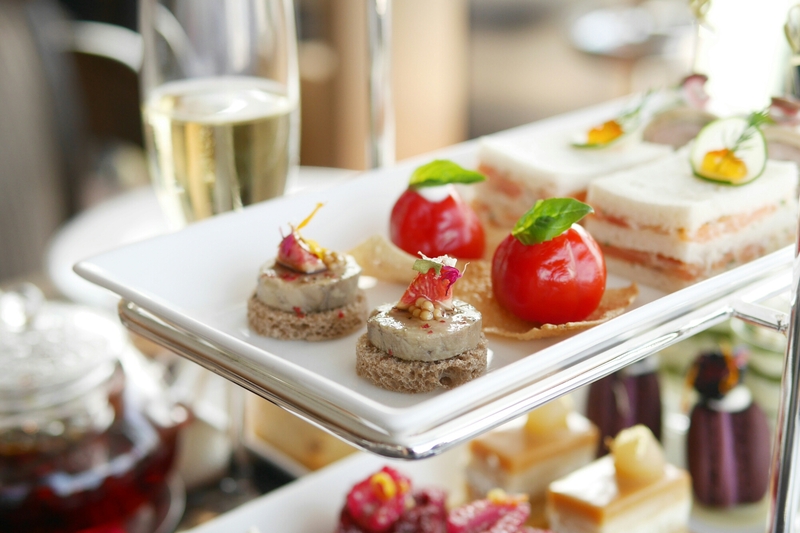 In fact this play on contrasting textures was a feature evident in most of the other afternoon tea items here – and we could not stop obsessing and analysing it, as if we were expert food analysts. The portion of clotted cream served looked a little stingy in size because I love to lather my scones with centimetres-thick clotted cream. But the waiters were happy to serve more on request, so maybe they’re just trying to avoid wastage? This time round, I stumbled upon their collaboration with Lalique. So they do change their items around every now and then, but judging by my two afternoon tea experiences, the creativity is definitely not something to worry about. The baba ganoush stuffed piquillo pepper on papadum was the perfect example of the East meets West theme I found at my dinner here over a year ago. It was interesting and delicious flavour-wise, but the contrasting textures of the bite-sized treat was so unique as well. The foie gras torchon with balsamic glazed figs was obviously another crowd pleaser. Though it was probably the least impressive item, I was honestly also pleased that they didn’t forego the more traditional smoked salmon sandwich. Again, we felt like food experts as we continued to notice the Chef adopting contrasting textures in the sweet items. 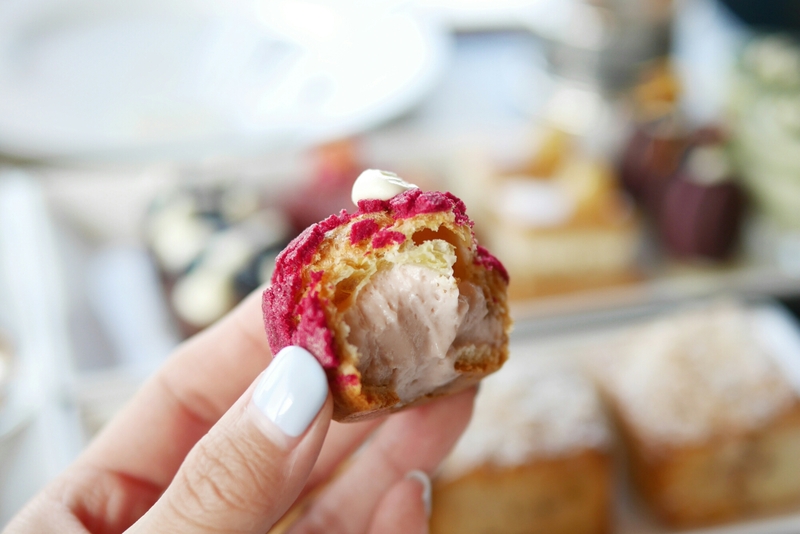 The strawberry-rose choux with mascarpone stuffing was quite certainly my favourite item on the rack (alongside the piquillo peppers), but the blackberry-yoghurt macarons with hibiscus was unexpectedly spot on perfect. It had such a thin delicate outer edge, while the inside was super moist and just a little bit fudgy too. We had high hopes for the green tea tiramisu, but it was honestly a bit of a let down – it was creamy but not very flavourful and just didn’t live up to the standards set by the other items. That said, the desserts were generally very impressive. 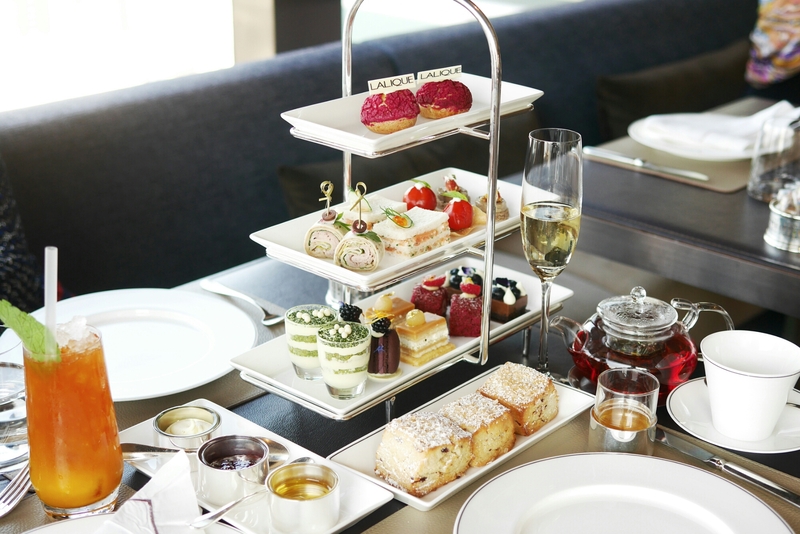 Although I have complained about afternoon tea spots which cost over HK$500 for two, the top-notch quality and creativity of food, excellent service and beautiful atmosphere, definitely warrant such price tag at Cafe Gray. Plus, the portion for two is actually quite substantial; we had quite a lot of leftovers to take home. This and my DvF experience at Cafe Gray were easily my most memorable afternoon tea experiences over the past 3-4 years. 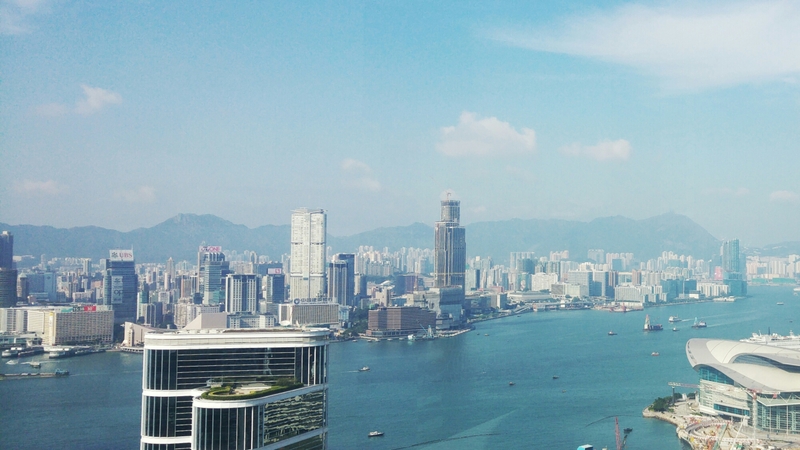 With that, I feel quite confident that it’s one of the best in Hong Kong!